Packaging Size: Available at all chemists in Packs 100ml & 200ml only. "Swarnakshree Pancha Tulsi Syrup" is an ayurvedic medicine. It is pure & safe to consume. Itcontain natural ingredients. Our medicines are long lasting and have no side-effects. .
"Swarnakshree Pancha Tulsi Syrup" is a general health tonic and can be used life long also. Cough and sore throat are common respiratory problems. Unlike conventional cough medications and antihistamines, intake of Vasaril does not cause drowsiness. It not only soothes the throat, but it also helps to treat underlying problems such as viral infections, excess mucus production and allergies that trigger coughing. 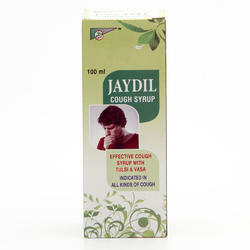 - Herbal formula to fight cough naturally.